Conventions | The Arcade Archives! Ubernerd unboxes the Pokémon 20th anniversary Edition of The New Nintendo 3DS. Plus Ubernerd recaps Pokémon Day at Krum’s World Comics and Collectibles and Lucky Straws Boba Tea Cafe that happened on February 27th, 2016. This is a Rebellion Production and is part of The Arcade Archives Network. No part of this video can be reproduced or rebroadcast without written consent of Rebellion Productions or The Arcade Archives Network. Pokémon Symphonic Evolutions comes to Orlando, FL at the Dr. Phillips Center for the Arts. So Übernerd527 along with Daniel and Kelly from The Reasons I’m Broke Podcast go on a Pokémon journey to see what it’s all about! Pokémon is the property of Nintendo and The Pokémon Company please support the official release. This is a Rebellion Production and is part of The Arcade Archives Network. No part of this video can be used unless with written permission from either Rebellion Productions, The Arcade Archives Network, or Nerd Up Media. Now you can watch the Tampa Bay Comic Con for yourself! Isn’t technology wonderful! We present for your listening pleasure Podcasting Made Nerdy our Panel from The Tampa Bay Comic Con 2015. Sorry in advance that this is not the entire thing but rest asurred that this will be on The 52 Now soon. Breaking news from The Arcade Archives Network! Two things that you Arcaders can’t miss out on! Ubernerd and the rest of the ZowieKerpowey.com will be at the Tampa Bay Comic Con this weekend. Sunday we’ll be having a pannel at 3 pm in Room 18. So come out to support us this weekend! Ubernerd was just recently interviewed on the Skycast’s 25th episode so check out here! After a long hiatus after our awesome anime podcasts we are back but this episode will be a little different. Recently we went back to Krum’s World Collectibles and Comics to join them in supporting our Local Artist. We also got some interviews with some of them and we are proud to present them to you! 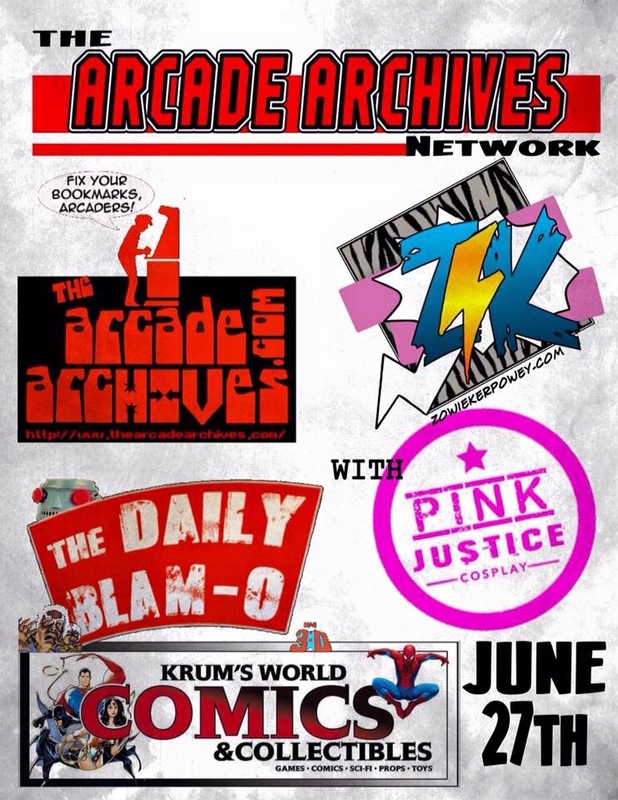 Saturday, June 27th at Krum’s World Comics & Collectibles in Winter Garden, FL join Übernerd527, Sheepydoodle, and RayGunn with special Guest Pink Justice Cosplay for Artists in the Courtyard. This special event is a celebration of Local Artist. So come and join us from noon to 4:00 (est) for fun and keep checking back with us to hear our report of the event.